IntensiFire FAQ How does it work? Where does it fit? *Note Woodstove, Woodburner, Logburner and Woodheater are terms used in different countries or regions to mean the same thing. How does the retrofit work? 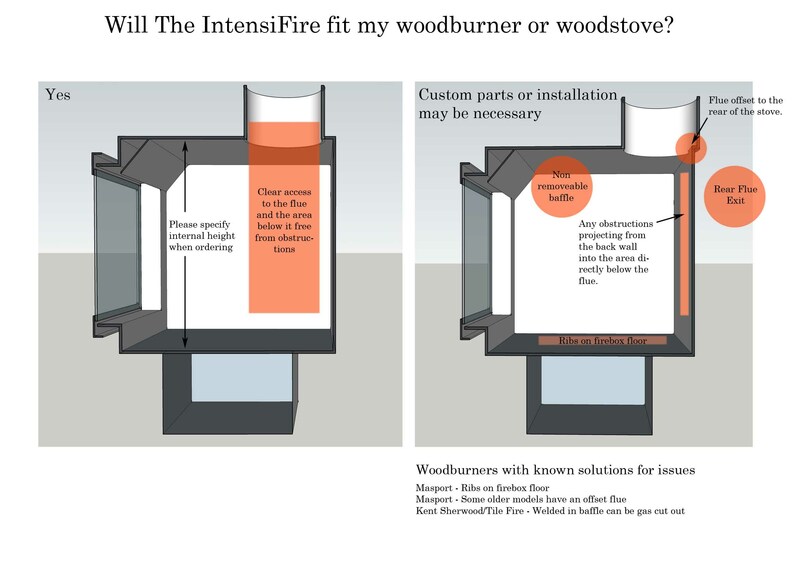 The IntensiFire fits inside your woodburner and changes the way it burns wood. Similar to syngas technology, or the way a car can run on woodgas, it breaks wood down into simple combustible gases that are then fully consumed by the super hot fire. Complete combustion means less wasted heat up your flue, a lot less! The heat goes into your room instead and is like putting in a larger model woodburner. This downdraft style of combustion is now seen in the all the new Ultra Low Emission Burners (ULEB) in New Zealand. This 2015 ULEB test is the toughest emissions to pass in the world because it includes start up, then wet wood, hardwood and softwood phases. The IntensiFire is particularly useful for stoves that were not originally designed with secondary air, but even a lot of modern stoves will benefit from an increase in efficiency and emissions. Will it fit my stove? The IntensiFire can be made to fit almost all stoves. The ease of installation will do so depends on your stove. A stove with a top exit 6” or 150mm flue is generally straight forward. Other types may need a bit more work. I am still learning the makes and models, particular those outside of New Zealand so send me some photos if you have any doubts. See the graphic at the bottom of this web page to help guide you. Whatever the cost it is worth it, new stoves with technology this good sell for $5000 (NZD). The IntensiFire assembly fits inside your fire and connects to the flue. That looks like it takes up a lot of room in the fire? The kit sells for $499NZD plus shipping. Shipping is free within New Zealand, approx $60 to Australia, and $120 to everwhere else. For the USA you source one part locally, the rest of the kit is $499 NZD including shipping. There may be some local adaption required depending on your model. Generally these modifications only cost a few hundred dollars. Message or call me for payment details. I can take a credit card payment via paypal, or via bank deposit. How much it improve my fire? Between 20% and 100% gain in efficiency, this all depends on the design and condition of your original stove. An older stove in poor condition could be improved by 100%. An older model in good condition around 60% gain, and 20% for the average new updraft model. For emissions the IntensiFire will make a dramatic difference. All testing to date has have found wall temperatures all within the New Zealand Building code. The IntensiFire has been used without issue in homes since 2011. The critical aspect to safety is the wall temperatures behind your fire. There is no precedent for a retrofit product like the IntensiFire, so I am having to develop the systems to ensure safety of the technology. You can help me do this. You can test yourself using a cheap thermometer, my distributors and I will help you through this process. A simpler method is in development so that checking your temperatures will be easier. We believe it is safe based on our experience, but strongly recommend you check because we don't want you to set your wall on fire. Take a record of the measurements. From these measurements a statement can be produced for your local authority, and insurance company, as a measure of proof that your fire is safe. In New Zealand you can test compliance with C2.2 of the building code by measuring wall temperatures, a maximum of 90°C. It is also the opinion of the Ministry for Building and Innovation that a building consent is required when fitting an IntensiFire. There are also simple and cheap methods for wall protection if needed. Will the firebox get damaged without firebricks? I get asked this a lot and my opinion is that firebricks are a combustion aid rather than a feature to protect the steel. Firebricks are option, but you can fit more wood in without them. I sometimes use them in autumn or spring when I don’t need a big fire. There is emissions data showing it can burn cleaner than natural gas, or the exhaust gas was safe enough to breathe. That doesn’t represent the whole burn cycle, but it is the cleanest combustion technology on the planet. The IntensiFire doesn’t use any catalyst or other consumable material to work, it is simply a change of combustion dynamic that creates an intense heat that burns up all the difficult to combust carbon monoxide (CO). CO levels rise below 750°C, and if your firebox was at that temperature it would be glowing red! The IntensiFire tube does get that hot though, check the second image on the home page. This complete combustion means more heat into your room. Is it clean air approved? At a national level in New Zealand there is no requirement for a retrofit to be approved. Just go ahead and install it to get the benefits. Ask if you are uncertain about your country. There are clean air bylaws around New Zealand, and the world, that are unclear about retrofits because there has never been an invention like the IntensiFire. The IntensiFire will in general help these councils lower air pollution from your old woodstove. If used as instructed there will be little to no visible smoke from the IntensiFire, and looking for smoke is the way any enforcement is done. The IntensiFire burns so hot that inferior materials won’t withstand the heat. It has to be made from the best quality materials available. There is a mix of custom designed refractory components, and high quality stainless steel. There is a five year warranty on parts. The stainless steel should last 10-20 years, the ceramics a bit less and will last about the same time as firebricks.